When it is time for Heavy Duty Commercial. Electronic Unit Injection system delivers 380 hp and 170kg.m of torque from the 10.0 liter in-line 6 engine. The H engine rated for Heavy Duty takes Hyundai SeasAll into a new dimension with the ability to serve the professional and commercial market. Wide range of flat torque proves Hyundai SeasAll’s diesel development capabilities are world-class and beats performance of competition’s comparable models. Economy is assured by the state-of-the-art fuel management system featuring electronic unit injectors. The electronic engine controlled system mkes it lighter, quieter and more fuel efficient with excellent compact dimensions. 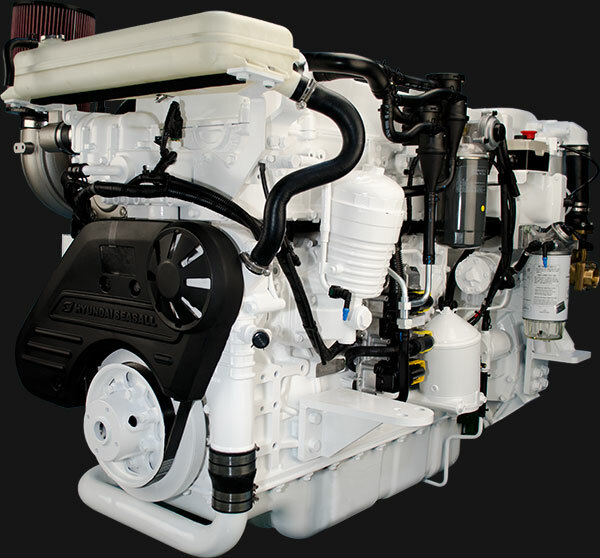 The unique one-piece CGI cylinder head makes it lighter and quieter than conventional heads for more comfort onboard. Plus, longevity is assured with close to double the fatigue life of aluminum.